If you are going to Iloilo to watch this festival, we are offering an Iloilo Dinagyang Festival Tour Package 2014, for your inquiries please email mariarona.beltran@yahoo.com or via mobile, 0998-989-3921. The Dinagyang Festival in Iloilo has been known as the "Best Tourism Event" in the country and one of the best reasons to visit the place. So we suggest, the earlier to book the accommodation and flights, the better to catch the cheapest options! 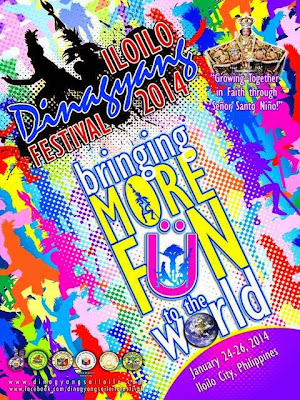 Iloilo Dinagyang Foundation, the official organization that handles the festival has a tagline already for the Dinagyang Festival 2014, it is "Bringing More Fun to the World." Final performances will be done simultaneously in each of the four judging areas---Freedom Grandstand, Quezon-Ledesma Streets, Iloilo Provincial Capitol and Ma. Clara Street- all within the city proper area. Thirteen tribes for the Kasadyahan and twelve tribes for the Ati - ati will compete each other. Take note, 3 previous Ati-ati tribe champions are expected to join again. For more information you can check the Facebook Fan Page of Dinagyang sa Iloilo Festival here. TIP: You can do a side trip to Guimaras island if you are going to Iloilo or add Bacolod. To view the itinerary of these places you may click here.